John Dempsey and Dana P. Rowe’s 1997 political rock musical The Fix will get a revised staging in New York under the direction of John Simpkins this fall. First produced by Cameron Mackintosh at the Donmar Warehouse in London in 1997, The Fix follows the mercurial rise of a charismatic young politician and the political machinery that created him. The musical made its U.S. debut at the Signature Theatre in Arlington, VA, in 1998. 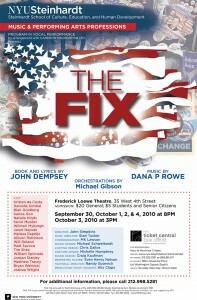 At the time of its U.S. premiere, a New York debut for The Fix was considered, but never materialized. New York University’s Program in Vocal Performance will give New Yorkers an opportunity to see the musical Sept. 30-Oct. 4 at the Frederick Loewe Theatre. Since the world-premiere staging, composer Rowe and book writer-lyricist Dempsey have made changes to the script and score of the musical, which will be represented in the New York run. Rowe and Dempsey will be on hand during the rehearsal process to work with director Simpkins (Bloodsong of Love) and the cast. The Fix will be performed by a cast of NYU students, including Kristen da Costa, Danielle Gimbal, Blair Goldberg, Kanoa Goo, Natalie Hinds, Kevin Mueller, Wilmari Myburgh, Jared Nepute, Melissa Rapelje, Allison Robinson, Will Roland, Matt Savoca, Tim Shea, William Spinnato, Jordan Stanley, Matthew Tracey, Bryan Welnicki and Joshua Wright. Designing the production are Michael Schweikardt (scenic design), Chris Dallos (lighting design), Michelle Eden Humphrey (costume design) and Craig Kaufman (sound design). Stan Tucker will musical direct with choreography by MK Lawson. Dempsey and Rowe have also penned the musicals Zombie Prom and The Witches of Eastwick. The Frederick Loewe Theatre is located at 35 West 4th Street.